Finally, there is only one more day until the wedding which means that I’m sharing my last brunch recipe today… Chocolate Pecan Torte. This is probably my favourite dish from the brunch because well, truth be told, I love chocolate. 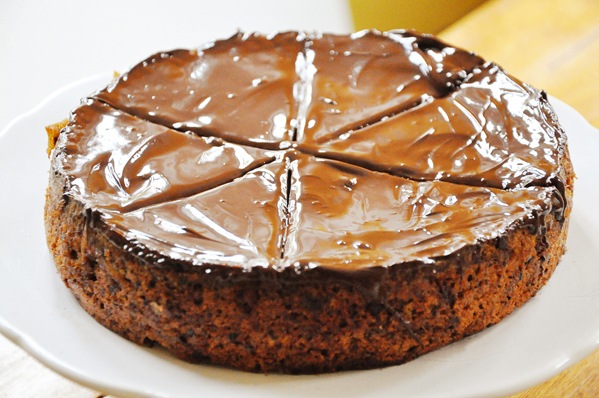 This torte is flourless, which means that all our gluten free friends can enjoy it too! The texture is not that of your typical flourless chocolate cake, the pecans are chopped so that they retain some texture. I know some people out there are getting tired of hearing about the Royal Wedding, but I think that’s one of my favourite parts. I love the buildup – the excitement throughout the media, the constant chatter about who we wish would design the dress (… Erdem! ), even the constant streams of specials about the royal family are entertaining to watch. * My food processor is not very powerful so I found using the blender worked for chopping the chocolate. Make sure you’re using the chop button/setting. Well, the wedding is finally tomorrow and here I am wondering what I’m going to do with myself once it’s all over. Sure wish I was attending your "Royal Wedding Brunch", Miss Living Lou...This cake sounds awesome! Have you thought of "You Tube-ing" your very own "Royal Brunch" so that all of your "loyal" followers can partake (at least) by viewing...Honestly, I can't get enough of all of the "hype" either...Like you, I can hardly wait to see Kate's dress...She is soooo beautiful, anything would look gorgeous on her, don't you think? I wish them a wonderful life together...Have a great day! Oo, this cake sounds great! Does the chocolate solidify once cooled or does it melt throughout the cake?